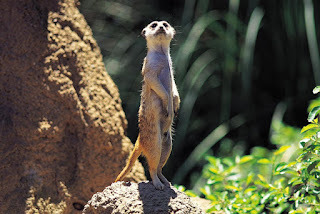 The meerkat or suricate is a small carnivoran belonging to the mongoose family. Meerkats live in all parts of the Kalahari Desert in Botswana, in much of the Namib Desert in Namibia and southwestern Angola, and in South Africa. A group of meerkats is called a "mob", "gang" or "clan". A meerkat clan often contains about 20 meerkats, but some super-families have 50 or more members. In captivity, meerkats have an average life span of 12–14 years, and about half this in the wild. Meerkats are primarily insectivores, but also eat other animals (lizards, snakes, scorpions, spiders, eggs, small mammals, millipedes, centipedes and, more rarely, small birds), plants and fungi (the desert truffle Kalaharituber pfeilii). Meerkats are immune to certain types of venom, including the very strong venom of the scorpions of the Kalahari Desert. Baby meerkats do not start foraging for food until they are about 1 month old, and do so by following an older member of the group who acts as the pup's tutor. Meerkats forage in a group with one "sentry" on guard watching for predators while the others search for food. Sentry duty is usually approximately an hour long. The meerkat standing guard makes peeping sounds when all is well. 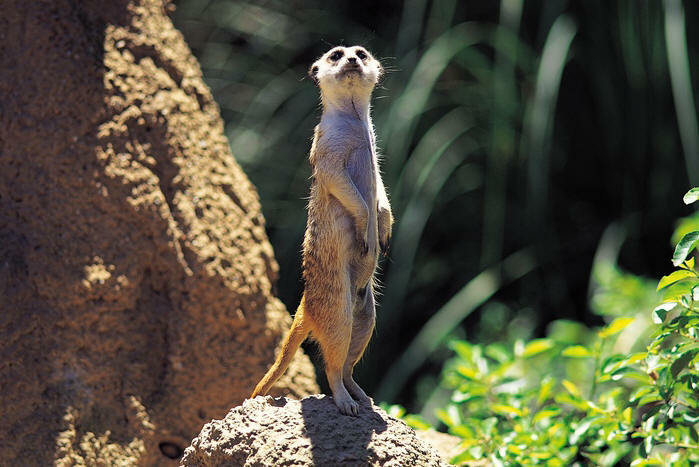 A meerkat has the ability to dig through a quantity of sand equal to its own weight in just seconds. Digging is done to create burrows, to get food and also to create dust clouds to distract predators. There is no precopulatory display; the male may fight with the female until she submits to him and copulation begins. Gestation lasts approximately 11 weeks and the young are born within the underground burrow and are altricial (undeveloped). The young's ears open at about 10 days of age, and their eyes at 10–14 days. They are weaned around 49 to 63 days. Usually, the alpha pair reserves the right to mate and normally kills any young not its own, to ensure that its offspring have the best chance of survival. The dominant couple may also evict, or kick out the mothers of the offending offspring. New meerkat groups are often formed by evicted females joining a group of males. Females appear to be able to discriminate the odour of their kin from the odour of their non-kin. Kin recognition is a useful ability that facilitates cooperation among relatives and the avoidance of inbreeding. When mating does occur between meerkat relatives, it often results in negative fitness consequences or inbreeding depression. Inbreeding depression was evident for a variety of traits: pup mass at emergence from the natal burrow, hind-foot length, growth until independence and juvenile survival. These negative effects are likely due to the increased homozygosity that arises from inbreeding and the consequent expression of deleterious recessive mutations. The avoidance of inbreeding and the promotion of out-crossing allow the masking of deleterious recessive mutations.